What Are Symptoms and Signs of an Allergic Reaction? What Tests Do Health Care Professionals Use to Diagnose an Allergic Reaction? Are There Home Remedies for Allergic Reactions? What Is the Treatment for an Allergic Reaction? What Types of Medications Treat an Allergic Reaction? What Other Treatments and Supplements May Help Allergy Symptoms and Signs? What Type of Doctors Treat Allergies? Is Follow-up Needed After an Allergic Reaction? Is It Possible to Prevent Allergic Reactions? What Is the Prognosis for an Allergic Reaction? Where Can People Get More Information About Allergic Reactions? An allergic reaction is the body's way of responding to an "invader." When the body senses a foreign substance, called an antigen, the immune system is triggered. The immune system normally protects the body from harmful agents such as bacteria and toxins. Its overreaction to a harmless substance (an allergen) is called a hypersensitivity reaction, or an allergic reaction. Anything can be an allergen. Dust, pollen, plants, medications (such as ibuprofen, sulfa drugs such as sulfamethoxazole and trimethoprim [Bactrim], codeine, amoxicillin [Amoxil, Amoxil Pediatric Drops, Trimox], cephalexin [Keflex]), foods (common food allergies include shrimp and other shellfish, peanuts), insect bites (such as mosquito bites or bee stings), animal dander (such as from a pet cat or dog, or rodents), viruses, or bacteria are examples of allergens. Reactions may occur in one spot, such as a small localized skin rash, itchy eyes, face bumps, or all over, as in a whole body rash such as hives (urticaria). Most allergic reactions are minor, such as a rash from poison ivy, mosquito or other bug bites, or sneezing from hay fever. The type of reaction depends on the person's immune system response, which is sometimes unpredictable. In rare cases, an allergic reaction can be life-threatening (known as anaphylaxis). The Asthma and Allergy Foundation of America (AAFA) estimates that at least one in 50 Americans (1.6%), and as many as one in 20 (5.1%), have had anaphylaxis occur, resulting in an average of 63-99 deaths per year. Allergies are very common. The AAFA states that allergies affect 50 million Americans, are the fifth leading chronic disease in the U.S., and the third leading chronic disease among children under 18 years of age. More than 40 million people have indoor/outdoor allergies as their primary allergy. In 2012, more than 11 million people in the U.S. visited their doctor for allergic rhinitis, and allergies to food account for 200,000 visits to the emergency room and 10,000 hospitalizations annually. Almost anything can trigger an allergic reaction. The body's immune system involves the white blood cells, which produce antibodies. When the body is exposed to an antigen (a foreign body such as pollen that can trigger an immune response), a complex set of reactions begins. The white blood cells produce an antibody specific to that antigen. This is called "sensitization." The job of the antibodies is to help white blood cells detect and destroy substances that cause disease and sickness. In allergic reactions, the antibody belongs to the class of immunoglobulins known as immunoglobulin E or IgE. This antibody type promotes production and release of chemicals and hormones called "mediators." Mediators have effects on local tissue and organs in addition to activating more white blood cell defenders. It is these effects that cause the symptoms of the reaction. Histamine is one of the better-known allergy mediators produced by the body. If the release of the mediators is sudden or extensive, the allergic reaction may also be sudden and severe, and anaphylaxis may occur. Allergic reactions are unique for each person. Reaction time to allergens can vary widely. Some people will have an allergic reaction immediately; for others, it may take hours to days to develop. Most people are aware of their particular allergy triggers and reactions. There are more than 160 allergenic foods. Certain foods are common allergens, including peanuts, strawberries, shellfish, shrimp, dairy, and wheat. Babies can also have food allergies. Common foods that can cause allergic reactions in babies include milk, eggs, nuts, and soy. People should talk to their child's pediatrician if they are concerned about food allergies in their baby. Food intolerance is not the same as food allergies. Allergies are an immune system response, while food intolerance is a digestive system response in which a person is unable to properly digest or break down a particular food. People can be allergic to wheat but not gluten. According to the American College of Allergy, Asthma & Immunology, there is no such thing as a gluten allergy; but one can have a sensitivity to this protein that results in gastrointestinal symptoms. Certain fruits or vegetables may cause an itchy mouth or scratchy throat after eating in people who have oral allergy syndrome. 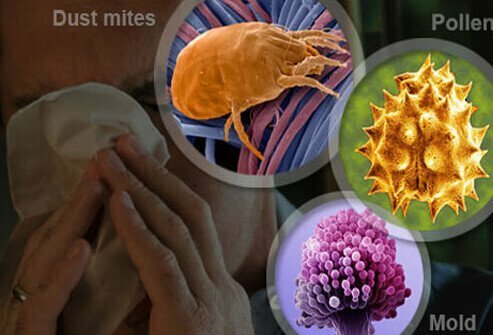 Seasonal allergic rhinitis (also called hay fever) is an allergy that occurs in the spring, summer, or early fall caused by allergies to pollens from trees, grasses or weeds, or to mold spores. Vaccines and medications (antibiotics such as penicillin and amoxicillin, aspirin, ibuprofen, iodine), general anesthesia and local anesthetics, latex rubber (such as in gloves or condoms), dust, mold or other fungi, animal dander from pets and other animals, and poison ivy are well-known allergens. Other known allergens can include detergents, hair dyes, cosmetics, and the ink in tattoos. Bee stings, fire ant stings, penicillin, and peanuts are known for causing dramatic reactions that can be serious and involve the whole body. Minor injuries, hot or cold temperatures, exercise, stress, or emotions may trigger allergic reactions. Sun exposure may cause allergic reactions in some people, often referred to as "sun poisoning." Often, the specific allergen cannot be identified unless someone has had a similar reaction in the past. Allergies, and the tendency to have allergic reactions, is hereditary -- that is, it runs in some families. Many people who have one trigger tend to have other triggers, as well. The look and feel of an allergic reaction depends on the body part involved and the severity of the reaction. Some reactions may be localized and limited, while others could involve multiple body systems. Reactions to the same allergen vary among individuals. Anaphylaxis is the term for any combination of allergic symptoms that is rapid, or sudden, and potentially life-threatening. Call 9-1-1 or activate emergency medical services immediately for suspected anaphylaxis. One sign of anaphylaxis is shock. Shock has a very specific meaning in medicine. Shock may lead rapidly to death. The organs of the body are not getting enough blood because of dangerously low blood pressure. The person in shock may be pale or red, sweaty or dry, confused, anxious, or unconscious. Breathing may be difficult or noisy, or the person may be unable to breathe. Shock is caused by sudden dilation of the blood vessels. This is brought on by the action of the mediators. If the drop in blood pressure is sudden and drastic, it can lead to unconsciousness, even cardiac arrest and death. Because allergic reactions can progress and worsen in minutes, causing complications, medical attention is always recommended for all but the most minor and localized symptoms. If the symptoms of an allergic reaction worsen over a few days, or if they do not improve with recommended treatment and removal of the allergen, call a doctor. People should tell a doctor if they have any allergic symptoms after using a prescribed drug or other treatment prescribed (see Drug Allergy). For typical allergic reactions, a doctor will examine an individual and ask questions about his or her symptoms and their timing. Blood tests and X-rays are not needed except under unusual circumstances. In the case of severe reactions, an individual will be evaluated quickly in an emergency department in order to make a diagnosis. The first step for the doctor is to judge the severity of the allergic reaction. Blood pressure and pulse are checked. An examination determines whether the patient needs help breathing. Often, an IV line is placed in case anti-allergy (antihistamine) medications are needed quickly. If the patient can speak, he or she will be asked about allergy triggers and previous reactions. Avoid triggers of allergic reactions. If people know they have an allergic reaction to peanuts, for example, they should not eat them and should go out of their way to avoid foods prepared with or around peanuts (see Food Allergy). Self-care at home is not enough in severe reactions. A severe reaction is a medical emergency. Do not attempt to treat or "wait out" severe reactions at home. Go immediately to a hospital emergency department. Call an ambulance for emergency medical transport. Use an epinephrine auto-injector (Epi-Pen, Auvi-Q) if one has been prescribed by a doctor due to previous allergic reactions (see "prevention" below). Slight reactions with mild symptoms usually respond to nonprescription allergy medications. Loratadine (Claritin or Alavert), cetirizine (Zyrtec), and fexofenadine (Allegra) are nonsedating antihistamines that can be taken over the long term. Diphenhydramine (Benadryl) can also be taken but may make someone too drowsy to drive or operate machinery safely. It can affect concentration and interfere with children's learning in school. These medications should be taken as directed for only a few days. Azelastine (Astelin or Astepro) and olopatadine (Patanase) are prescription antihistamine nasal sprays used to relieve nasal symptoms of seasonal allergies. These medications usually cause less drowsiness than oral antihistamines but may still make some people drowsy. For rashes or skin irritations, an anti-inflammatory steroid cream such as hydrocortisone can be used. Allergy eyedrops may be used when symptoms involve itchy or watery eyes or puffy eyelids. Mast cell stabilizers: over-the-counter versions include Claritin Eye and Refresh Eye Itch Relief. Prescription mast cell stabilizer eyedrops include pemirolast potassium (Alamast), nedocromil sodium (Alocril), lodoxamide (Alomide), and cromolyn (Crolom). Decongestant eyedrops are often available over the counter, including Clear Eyes, Refresh, and Visine. Combination antihistamine/mast cell stabilizer eyedrops include epinastine (Elestat), olopatadine hydrochloride (Patanol/Pataday), and ketotifen (Zaditor, Alaway). For small, localized skin reactions, use a cold, wet cloth or ice for relief. One option is to apply a bag of frozen vegetables wrapped in a towel as an ice pack. Generally, antihistamine medications are the treatment of choice after the allergen is removed. Very severe reactions may require other therapy, such as oxygen for breathing difficulties or intravenous fluids and/or epinephrine to boost blood pressure in anaphylactic shock. Patients with very severe reactions usually require hospitalization. There are many types of anti-allergy medications. The choice of medication and how it is given depends on the severity of the reaction. Long-acting antihistamines, such as cetirizine (Zyrtec), fexofenadine (Allegra), and loratadine (Claritin), can relieve symptoms without causing sleepiness. These medications are available over the counter. They are meant to be taken for months at a time, even indefinitely. Most can be taken once a day and last for 24 hours. Prescription montelukast sodium (Singulair) is a type of antihistamine that can help relieve symptoms of allergic rhinitis. Nasal corticosteroid sprays are widely prescribed for nasal symptoms not relieved by antihistamines. These medications work very well and are safe, without the side effects of taking steroids by mouth or injection. These sprays take a few days to take effect and must be used every day. Examples are fluticasone (Flonase), mometasone (Nasonex), and triamcinolone (Nasacort). Fluticasone and Nasacort sprays are now available over the counter. This drug is given only in very severe reactions (anaphylaxis). It is injected and acts as a bronchodilator (dilates the breathing tubes). It also constricts the blood vessels, increasing blood pressure. For a less severe reaction involving the respiratory tract, an inhaled medication similar to epinephrine may be used, as in asthma. This drug is given in an IV or in a muscle to rapidly reverse the actions of histamine. Oral diphenhydramine is usually enough for a less severe reaction. Corticosteroids are usually given via IV at first for rapid reversal of the effects of the mediators. These drugs reduce swelling and many other symptoms of allergic reactions. It will probably be necessary to take an oral corticosteroid for several days after this. Oral corticosteroids (such as prednisone or methylprednisolone) are often given for less severe reactions. A corticosteroid cream or ointment may be used for skin reactions. Corticosteroid nasal sprays reduce the discomfort of a "stuffy" nose. These drugs should not be confused with the steroids taken illegally by athletes to build muscle and strength. Other medications may be given as needed. In some people, cromolyn sodium (NasalCrom) nasal spray prevents allergic rhinitis, or inflammation of the nose that occurs as an allergic reaction. Decongestants can restore sinus drainage, relieving symptoms such as nasal congestion, swelling, runny nose, and sinus pain (pain or pressure in the face, especially around the eyes). They are available in oral forms and as nasal sprays. They should be used for only a few days, as they may have side effects such as high blood pressure, rapid heartbeat, and nervousness. Allergy shots: These are given to some people who have persistent and disruptive allergy symptoms. The shots do not treat symptoms, but by altering the immune response, they prevent future reactions. This is referred to as immunotherapy. Treatment involves a series of shots, each containing a slightly greater amount of the antigen(s) that cause the reaction. The shots are administered every two to four weeks for two to five years. Ideally, the person will become "desensitized" to the antigen(s) over time. The effectiveness of shots varies between individuals. Probiotics: There have been studies that have looked into the use of probiotics (live microorganisms thought to be beneficial to the body) to treat allergies, particularly atopic dermatitis in infants. Results of a recent meta-analysis were mixed, and their effectiveness has not yet been proven. More study is needed about the role of probiotics in the management of allergic reactions. Acupuncture: Studies have shown mixed results in the effectiveness of acupuncture to treat allergies. It may be helpful for year-round types of allergies but not seasonal allergies such as hay fever. Many different kinds of doctors treat allergies. One may initially see a primary care provider (PCP), including a general or family practitioner or their child's pediatrician, if allergies are suspected or mild. In severe cases such as anaphylactic reactions, one may see an emergency medicine specialist in an emergency department. To manage allergies over the long term, many people see an allergist-immunologist, a physician who specializes in treatment of allergies. One may also see an otolaryngologist (also called an ear, nose, and throat specialist, or ENT) to manage sinus problems. If allergies result in itchy skin or other skin reactions, the patient may see a dermatologist. Allergic reactions are sometimes unpredictable. Always watch for a return of symptoms as medications wear off or exposure to an allergen trigger continues. Return of symptoms may be sudden and severe. Anticipate a possible return of the reaction and a need to return to the doctor's office or emergency department. Therapy to suppress an allergic reaction may involve long-acting antihistamines and other anti-allergy medications in combination to suppress the body's immune response. Severe cases may require a course of steroid treatment lasting as long as four weeks. Most people learn to recognize their allergy triggers; they also learn how to avoid them. An allergy specialist (allergist) may be able to help identify someone's triggers. Several different types of allergy tests are used to identify triggers. Skin testing is the most widely used and the most helpful. There are several different methods, but all involve exposing the skin to small amounts of various substances and observing the reactions over time. Blood tests (radioallergosorbent test or RAST) generally identify IgE antibodies to specific antigens. Other tests involve eliminating certain allergens from the environment and then reintroducing them to see if a reaction occurs. People with a history of serious or anaphylactic reactions may be prescribed an auto-injector, sometimes called a bee-sting kit. This contains a premeasured dose of epinephrine (EpiPen and Auvi-Q are some brand names). They carry this with them and inject themselves with medication immediately if they are exposed to a substance that causes them to have a severe allergic reaction. There is some evidence that breastfed infants are less likely to have allergies than bottle-fed infants. Most allergic reactions respond well to medications, but some can be rapid and deadly (anaphylaxis). Hives, swelling, breathing difficulties, even anaphylaxis often improve and disappear in minutes to hours. Some rashes take several days to heal. A doctor may want to monitor the patient for a few hours. A dangerous allergic reaction may warrant an overnight stay in the hospital. Allergic reactions will continue with continued exposure to the allergen or trigger. Avoid any triggers that cause an allergic reaction. Ingested, inhaled, or injected allergy triggers may take days for the body to eliminate. Continued medical therapy is necessary for continued exposure. People may be referred to an allergy specialist if they continue having reactions. Allergy shots desensitize you by turning down this immune response to the antigen. As a result of immunotherapy, the white blood cells no longer respond as strongly to the antigen, and less production of the immunoglobulin E antibody to this antigen occurs. So, when you are exposed to this antigen, less severe allergic reactions occur in affected areas like the eyes, nasal mucosal surfaces, and the bronchial airways. What were the symptoms and signs of your allergic reaction? What was the treatment for your allergic reaction? Please describe your experience with an allergic reaction. Have any home remedies been effective for your allergic reaction(s)? Have you ever had an allergic reaction to a drug? Did you have testing to confirm which substances cause your allergic reactions?